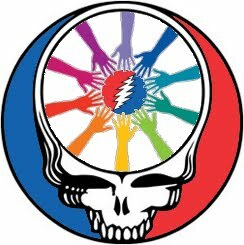 The Grateful Dead Listening Guide is excited to announce that we have launched our Facebook fan page sharing campaign which matches Facebook friends, Facebook technology and a charitable donation to a worthy cause. Today we start our “contest.” If we can drive the total fan count of the GDLG Facebook fan page to 5000 “likes” by June 30th, a very generous donation will be made to the Rex Foundation on behalf of the Grateful Dead Listening Guide and all of its fans. SN-Reach, a technology/marketing company based in northern California, has asked the Grateful Dead Listening Guide to help beta test their new Facebook sharing application. Since deadheads epitomize “community,” we represent a perfect audience to help measure the effectiveness of their technology. To inspire the use of their Facebook app and in an effort to tie this exercise to something a bit more meaningful than simply gathering good data, SN-Reach is offering up a sizable donation to the Rex Foundation when we hit our goal. In the end, the GDLG can gain exposure to a wider audience, SN Reach can gain valuable insight into their application and a worthy cause will receive a monetary gift. Helping is amazingly easy and takes next to no time at all. You can show your support for the Guide and the charity by heading directly to this GDLG Sharing Page, or clicking on the large "Like it? Share it!" button below. There, after making sure that you “LIKE” the GDLG fan page yourself, you can use the handy “SHARE” button under the main message to get the word out to your Facebook friends who you think might help us hit the 5000 fan goal. Thanks in advance for your help and your time. Hey man have you checked out the new Robert Hunter stuff? Cowritten with Jim Lauderdale.